Those of you who have read Warnings know that Joe Audsley was the hero of the Ruskin Heights tornado. It was Joe who put the Weather Bureau (now National Weather Service) into the tornado warning business. 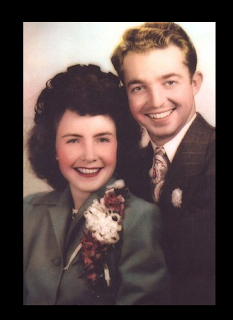 Joe lost his wife of 65 years, Lee, today. And, my friend, Bob Barry, Sr. died yesterday. 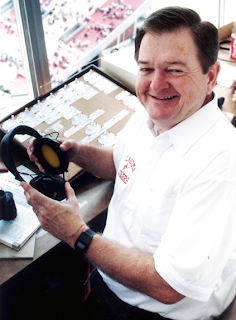 Bob was the sports director at WKY TV, my first TV station, as well as the "Voice of the Oklahoma Sooners" for many years. Again, if you have read Warnings and Bob's name seems familiar, Kathleen and I had him over to our apartment for dinner on June 7, 1974, the night before "TV Weather Grew Up." It was Bob who encouraged me to explain -- the night before -- that I expected major tornadoes the next day. This was simply not done by meteorologists in 1974. Kathleen and I extend our deep sympathy and best wishes to Joe and his family and to Bob's two sons and the rest of his family. Another Crack in the Drought? 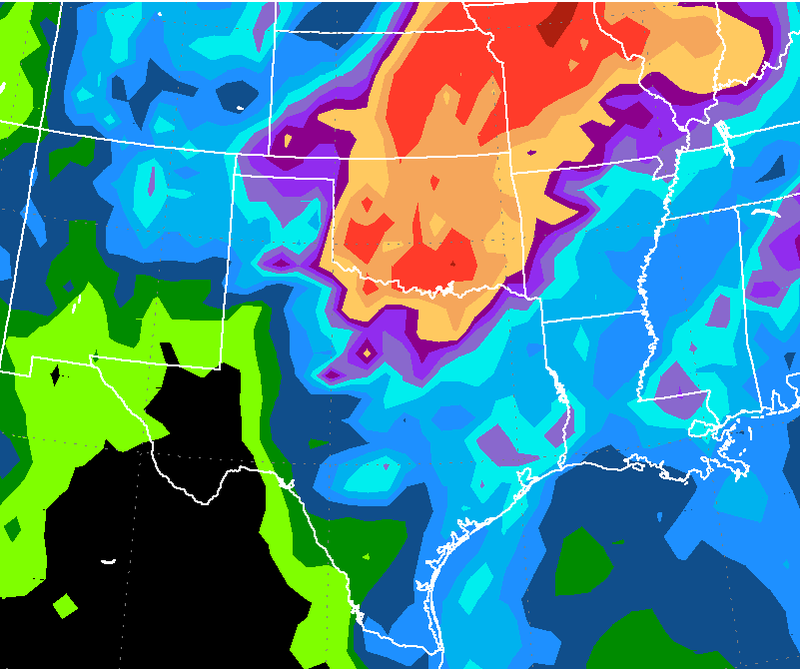 The weather pattern is again becoming more favorable for rain in the southern Plains. Here is the ECMRF model's rainfall forecast for the next ten days. 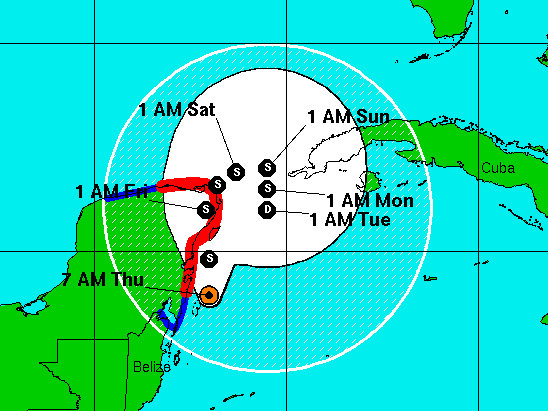 Data via AccuWeather's PRO site. in much of southern Wyoming. SAN LUIS VALLEY — If aphids measured more than a quarter of an inch and had a pair of thumbs, the Valley’s human population would not have survived summer 2011. 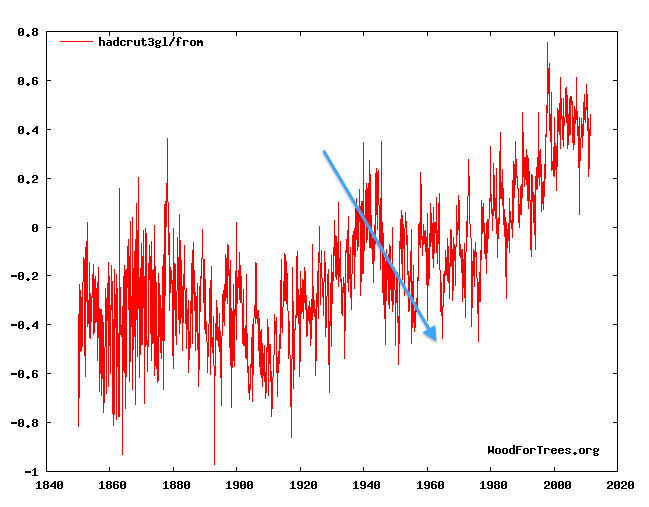 Last week, I posted on the Berkeley BEST Project's publicized (but not peer-reviewed) findings that the earth was warming faster than some other studies indicated. I also linked to two comments from statisticians that found BEST's statistical methodology wanting. If you follow the blogosphere pertaining to atmospheric and climate science the last week, you've watched a firestorm develop over what appears to be a misleading presentation of BEST's own data. different on the two two graphs. The lower graph plots temperatures the last ten years. 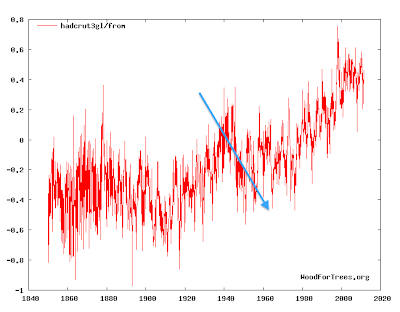 It seems that BEST's own raw data shows that the earth stopped warming the last dozen years as I, and even many pro-global warming climate scientists, have observed. 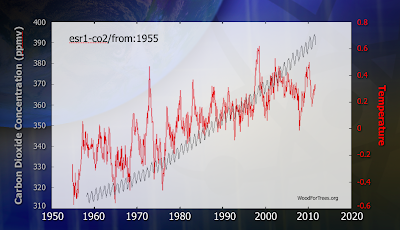 This seems to contract BEST's PR about global warming "accelerating." The Daily Mail's story is here. Judy Curry comments here. So far, nothing I have seen contradicts the clear data that shows both earth's atmospheric temperature and ocean heat content have been flat to falling for more than a decade. While there is no reliable way to forecast these values going forward, it is safe to say the science indicates, for now, global warming has stopped. Finally, here is another writer's take on the situation. He describes it as a climate science "food fight." That seems about right. Sheldon of The Big Bang Theory goes to a Halloween party as "the Doppler effect." ...for a very nice article about the yesterday's Weather Festival. Click to see full resolution image. Taken by NASA earth observing satellite earlier today. 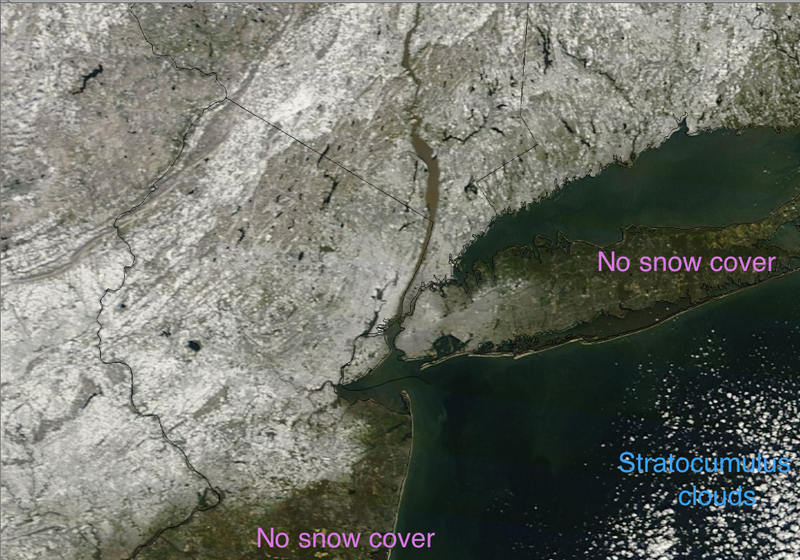 Whiter = heavier snow cover. The unfrozen Hudson River shows up nicely from top center south to where it empties into New York Harbor down the west side of Manhattan. ADDITION: 4 million are now said to be without power. Just Because a Headline Writer Wasn't Paying Attention Doesn't Make a Storm a "Surprise"
This is why I write postings like the one immediately below. Journalists are constantly misrepresenting weather forecasts as far less accurate than they are. My mentor, Don Whitman, a forecaster with the National Weather Service, taught me the importance of getting the forecast of the first snow of the season correct. As Don used to say, "If you get the first one wrong, people remember it all winter." The challenge is that temperatures are often marginal during the first snow of the season so it has always been especially difficult to get the first snow of the season right. So, it is amazing how good the forecasts were of the just-ended record snow storm in the East. AccuWeather started talking about it Thursday and I posted about the pending storm on this blog Friday at 8:57am -- about 22 hours before the heaviest snow began falling. Later Friday, I (along with others) posted: "widespread power failures are likely." I also posted, "Just in case, here is my Airline Survival Guide." Rule #1 in the Guide is to avoid the problem by not flying into major winter storms. Now, we learn more than 2 million people are without power and that flights were stranded on tarmacs for up to seven hours. 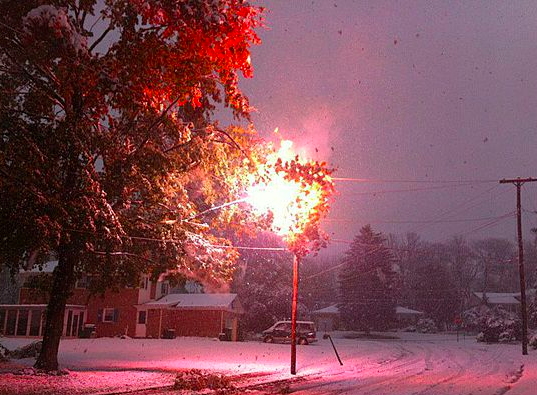 AccuWeather's Facebook page has great coverage of the storm. Details on the power failures here. The point of all of this is to point out the remarkable improvement in forecasts of all types of storms. 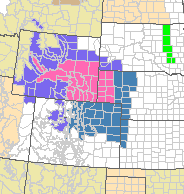 Meteorology has advanced to the point that storm warnings should be taken seriously and acted upon. And, customers of Connecticut Power are told to prepare for a week without power. This will be worse than recent Hurricane Irene. Frequent readers of "Meteorological Musings" know what a fan I am of the Kansas Cosmosphere, generally thought to be the second best space museum in the world. It is second only to the Smithsonian's Air & Space Museum. 4:45 pm. Drawing for TIV2 ride winners followed by rides. I will be incorporating some of the lessons learned during the just-ended tornado season, the worst since 1953. Looking forward to seeing everyone next weekend at the Cosmosphere!! Just northwest of NYC, via Instapundit. Mindy and I had a terrific day at the National Weather Festival in Norman. It was Vegas for weather aficionados. It was also the biggest book sale and signing ever for Warnings. Eighty books were sold! Photos by Mindy Cook. Click to enlarge. My favorite part was seeing so many old friends and making so many new ones, including our great friend Cat Taylor and students involved in weather safety demonstrations. Cat is passionate about her pageant platform of storm safety and was selling tiaras to raise money to enlarge the education effort. In a nod to the movie Twister, our table was near the "Flying Cow" Cafe in the Weather Center building. In Warnings I describe several cows that ended up far from home thanks to tornadoes. Of course, with advanced warnings, there is no need for cows to become airborne any more. Outside, there were numerous specialized vehicles used for storm chasing and reporting along with rescue and operations when disasters strike. Here is one of the numerous television station chase vehicles. Thanks to Kelli Tarp and all of the other organizers for a great time and a great day. 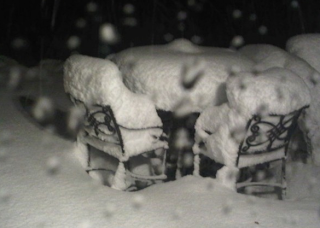 UPDATE: NYC has recorded its earliest-ever 1" of snow...still snowing. 2nd UPDATE: Newark has reported an early season record of 3.8". Roger Pielke, Jr. has a wonderful essay on scientists playing at politics. I encourage you to read the whole thing. For instance, this roundtable was apparently motivated by Texas Gov. Rick Perry taking issue with aspects of climate science that many in the research community have long viewed to be settled science, with only a few outliers taking issue. Perry's views prompted rebukes from scientists and fueled reverberations through the blogosphere's echo-chambers for weeks. Yet in sharp contrast, when President Barack Obama sought to explain the recent Texas drought as a consequence of human-caused climate change, few (if any) of those same scientists found fault with his views, despite the overwhelming consensus (also disputed by a few outlier voices) that individual events cannot be attributed to the human influence on climate because such changes are observed as statistics that play out over several decades and longer. The selective behavior goes to process as well. When NASA scientist James Hansen was told by the Bush administration that he could speak with the press only when accompanied by agency "minders," the scientific community loudly and quite rightly expressed outrage. Yet, when the Department of Health and Human Services under President Obama recently announced a similar policy, virtually all of those once-outraged voices were mute. An observer of this selectivity might note that significant parts of the scientific community have a political preference for Democrats over Republicans. For instance, a survey of the membership of the American Association for the Advancement of Science found only 6 percent registered as Republicans, and almost 10 times more registered as Democrats. Scientists who take on politicians in the name of science risk being perceived as simply using science as a fig leaf of expertise to advance what ultimately are political preferences. When scientists go into political battles armed with their expertise and invoking science as the basis for their claims, they may think that they are working to improve the factual basis underlying political debates. This of course is a worthwhile ambition, and to the extent such efforts are successful, they will help to improve the quality of policy discussion. But if scientists are not mindful of the pitfalls that accompany their efforts to insert themselves into the bright glare of political campaigns, they may find that rather than making politics more scientific, they have instead made science more political. Prominent scientists and leading scientific organizations face much greater risks in this regard than do rank and file scientists. No matter how well intentioned, actions that exacerbate the politicization of science diminish both our science and our politics. On the Way to Norman! At this ridiculous hour, Mindy and I are on our way to Norman for the National Weather Festival. She is driving since she is an early riser. This is the one and only time to get Warnings in hardcover for $10 (tax included). We take checks and cash. The book has 5-star ratings at both Amazon and B&N and has received superb reviews. The reason for the greatly reduced price is because of the large number of students expected to attend. If you'll remember, inspiring the next generation of scientists was one of the reasons I wrote the book. Here is a map of forecast snowfall accumulation from midnight to 4pm EDT. Note: These are not "storm totals" as the snow is forecast to continue beyond 4pm in some areas. This is intended to help you plan your day. New York has received measurable snow before Halloween only 3 times since 1869. These events were never more than one inch. If the forecast holds, this would be the earliest 1″ snowfall in New York City since the Civil War. 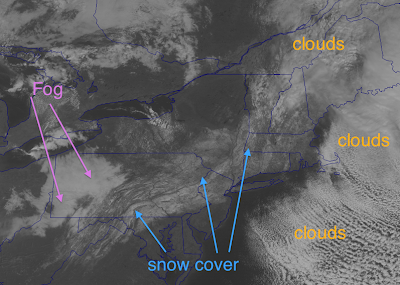 I've done some tweaking to the new "North American Model" output. 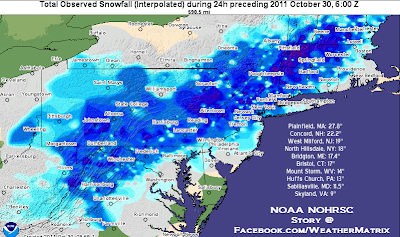 This is my forecast of snowfall (not necessarily snow accumulation) until 8pm EDT tomorrow evening. Widespread power failures likely in red and gray areas. Just in case, here is my Airline Survival Guide. 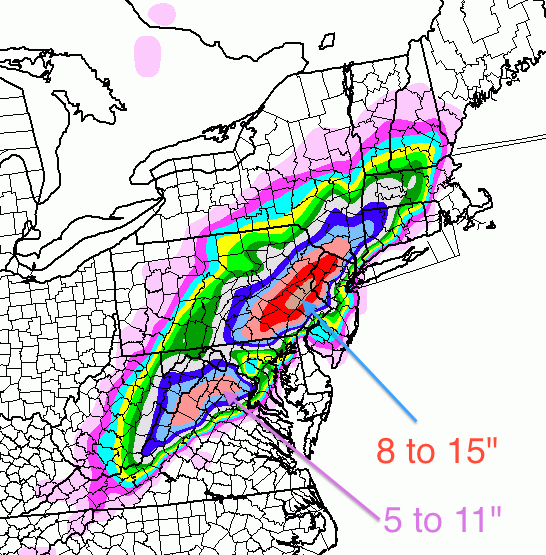 This is the snow accumulation forecast between now and 8am EDT Saturday. If you are in the area where AccuWeather is forecasting heavy snow, please prepare accordingly. 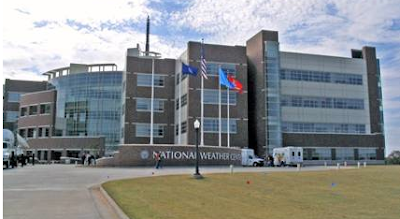 Tomorrow is the big day: From 9am to 1pm is the National Weather Festival in Norman, OK at the Weather Center off Highway 9 on OU's south campus. It is your only chance to purchase a copy of Warnings in hardcover for $10. We accept cash and checks. Mindy and I will see you there! I've not said much about the developing Northeast snow storm because AccuWeather is doing its normal outstanding job covering it. As of this moment, there are no significant flight delays. However, that will likely change this afternoon as the storm approaches the area. The accumulating snow should begin late tonight. Twice, in both the bottom of the ninth and tenth innings, the Rangers were one strike -- one strike -- away from winning their first World Championship. Yet, the Cardinals came back with a walk-off home run in the bottom of the 11th to force Game 7 tonight. This important polar orbiting weather satellite is scheduled for launch today. Here is a video show its construction. UPDATE: The launch was a success. CNN video here. I taught all three of my children, catch a fly ball with two hands!!! Over and over, I taught them how important it was. 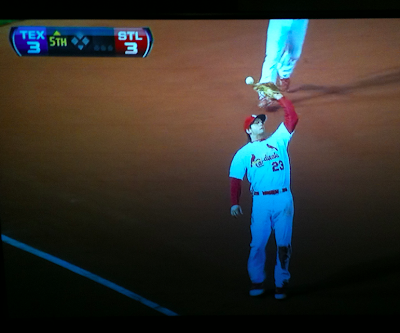 Apparently, you can play third base in the World Series without observing that basic bit of baseball. UPDATE: 11:42PM, Cardinals win it 10-9 after 11 innings. It was an amazing game, one of the best I have ever seen! ...and Roger Pielke, Sr. has a wonderful post about what the pro-GW folks have to say about the lack of warming. What is fascinating to me the arrogance of some of these comments. It is the skeptics who have been pointing out the ever-increasing divergence between the pro-GW IPCC's forecasts and reality. Yet these scientists keep treating the skeptics with scorn. I believe global warming is a small problem when all of its pluses and minuses are computed. I readily acknowledge I could be wrong as no one knows that the earth's heat content will look like in 5, let alone 50, years. It is easy to issue "highly likely" forecasts of the climate 100 years from now. No adult will be around to see how well that forecast worked out. One reason so many meteorologists view the dogmatic statements about the state of the atmosphere in 100 years is that Mother Nature frequently keeps us humble since our forecasts are subjected to public scrutiny every day. Well thank you IPCC authors for letting us know what is really behind that “very likely” assessment of attribution 20th century warming. 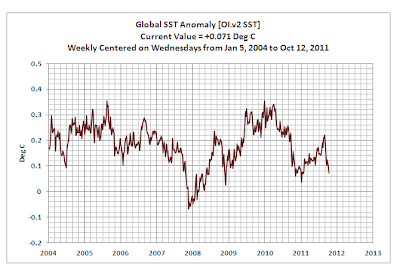 A lot of overbloated over confidence that cannot survive a few years of cooling. The light bulbs seem to be just turning on in your heads over the last two years. Think about all the wasted energy fighting the “deniers” when they could have been listening, trying to understand their arguments, and making progress to increase our understanding of the causes of climate variability and change. 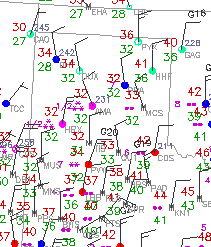 The clusters of snowflakes on the current weather map shows moderate intensity falling snow in northwest Texas. AccuWeather has details. Above is the latest forecast from the National Hurricane Center that shows Tropical Storm Rina making landfall near Cancun then hanging around the next few days. Serious beach erosion is likely along with heavy rains. We will be in the atrium of the National Weather Center just off Highway 9 in Norman Saturday from 9 to 1. 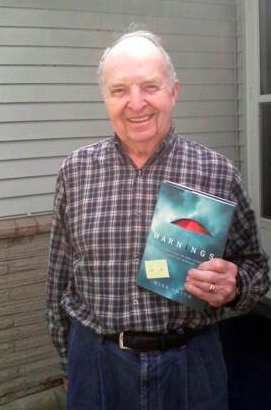 I be autographing and selling copies of Warnings in hardcover for $10 each. This is a one-time opportunity. 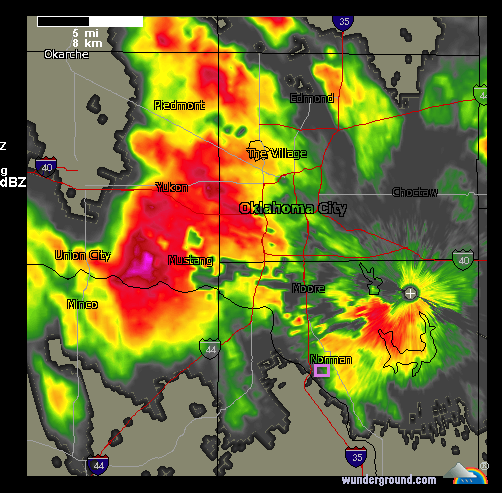 We have talked several times on this blog about how the Joplin tornado was invisible from the city as it approached. The photographer makes that statement when the bottom of the funnel seems to disappear. 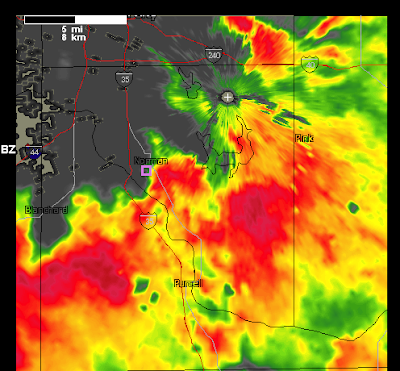 This was likely because some dry air was ingested into the storm and caused the cloudy bottom of the funnel to briefly dissipate. However, the tornado is still extremely dangerous because, as you see, it is not only picking up objects, it is spinning out debris. 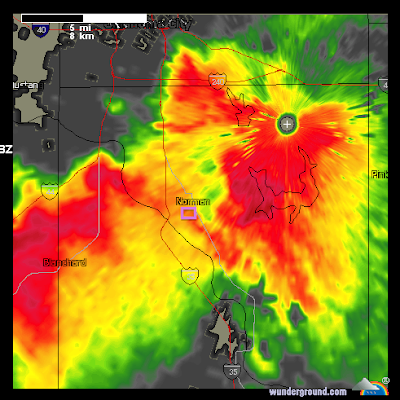 There is no correlation between the appearance of a tornado and its intensity. 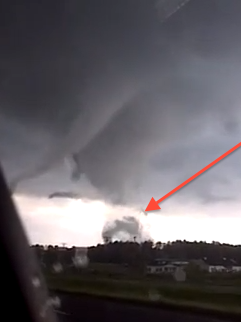 Tornadoes are very dangerous and the eye is often misleading. 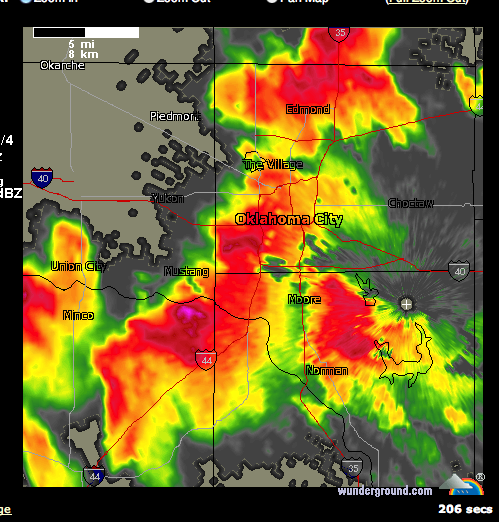 When a tornado warning is issued, please get to shelter immediately. Don't go outside to look at the storm as that might cost you your life. Let some other person tape it and look at the tape on YouTube when you are safe and the storm has passed. I'm very concerned about the quality of teaching of science and technology at all levels. So are Bill and Melinda Gates and they offer some wonderful suggestions. 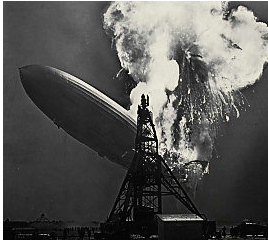 Why did the Hindenburg explode? Because the U.S. government refused to sell Kansas helium to Germany. That and many other interesting items about helium from Dan Voorhis at The Wichita Eagle. Interesting and useful article from the Wall Street Journal. Many have read Dr. Richard Muller's op-ed in Friday's Wall Street Journal that discusses the Berkeley (BEST) project's re-analysis of land temperatures. It appears to find that temperatures are rising more quickly than originally thought for "the last 50 years." Hurricane frequency is not increasing. His analysis was for land temperatures only. The more important metric is ocean heat content and his project did not look at that. The temperature-station quality is largely awful. The most important stations in the U.S. are included in the Department of Energy's Historical Climatology Network. A careful survey of these stations by a team led by meteorologist Anthony Watts showed that 70% of these stations have such poor siting that, by the U.S. government's own measure, they result in temperature uncertainties of between two and five degrees Celsius or more. We do not know how much worse are the stations in the developing world. Using data from all these poor stations, the U.N.'s Intergovernmental Panel on Climate Change estimates an average global 0.64ºC temperature rise in the past 50 years, "most" of which the IPCC says is due to humans. 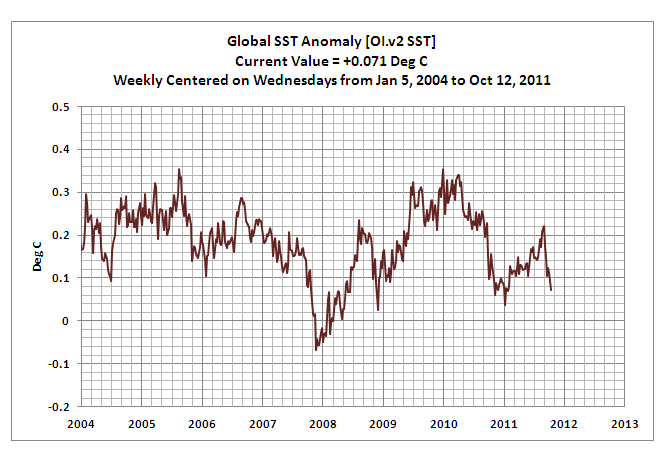 Yet the margin of error for the stations is at least three times larger than the estimated warming. Second, talking about 1950 as a starting date is interesting because it was during a mid-20th century cooling period. Dr. Muller's article starts its comparison in the middle of this period of major cooling (blue arrow) which causes it to exaggerate the rate of warming to 2010. These results are completely unexpected based on the IPCC's theory of global warming. Finally, I am not a statistician, but here is an analysis of BEST's statistical analysis that finds their techniques wanting. But now let me explain why you should not be a skeptic, at least not any longer. I appreciate that he is making a sincere comment and that his project has made a useful contribution to the discussion. But, he is not addressing the numerous reasons I, and many other meteorologists, are skeptical. P.S. Additional comments about the BEST analysis here. Take a look at the huge hailstones that passed just northwest of Norman while 80,000 were waiting out the weather delay. Changing Planes in Denver this Week? The first snow of the season forecast for the Denver area. AccuWeather has details. The December issue of Trains will be out next week. I have an advance copy because AccuWeather's Steve Pryor and I helped them put together their "Map of the Month." This map shows the areas where the weather is typically worst on U.S. railroads. If you pick up the magazine, don't miss Don Philips' column on DHS and its ridiculous crusade against photography on page 9. Yes, even I have been approached and questioned by a policeman while taking train pictures. You might also have heard the news that the TSA is expanding its program of stopping vehicles on the nation's highways. You used to be able to avoid the TSA by not flying. That is no longer the case. Captain Steven M. Roller of the Los Angeles County Sheriff's Department has told Long Beach Post that it is standard practice to detain and pat down photographers for "potential terrorist" activity such as photographing a courthouse. How long are we going to continue to put up with these threats to our liberties?! Don ends his column by quoting Benjamin Franklin, Those who would give up essential liberty to purchase a little temporary safety deserve neither liberty nor safety. Agree 100%! Thanks, Don. Got a call Saturday afternoon from a friend headed to Munich telling me how vital my Airport Survival Guide was to getting him out of a real jam. It is the 6th most popular posting in the history of this blog. If you've never read it, click here. Print it out and keep it with your travel kit. More from AccuWeather Regional Radar at 11:10pm. I expect these storms will bring needed rain to north central Texas BUT they are still producing large hail and strong winds. I believe they will still be rather stout when they reach the Metroplex. Cardinals won game 3, 16-7. 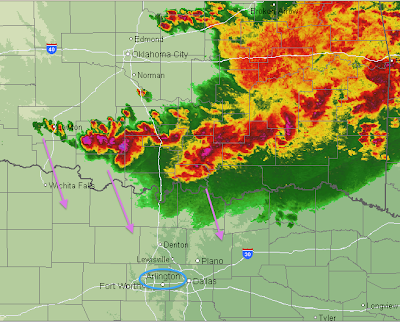 11:20pm: Unconfirmed report of damage in the Paul's Valley, OK area from these storms. Above is the AccuWeather regional radar as of 10:15pm central time. The storms are about three hours away. The game should be fine except if it goes deep into extra innings. UPDATE: 10:29pm. 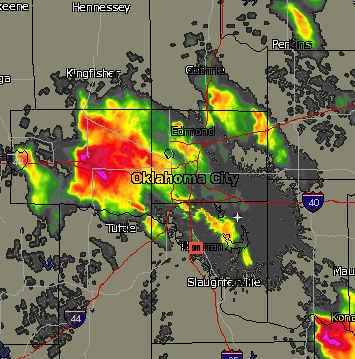 Tornado warning issued for Carter, Jefferson and Stephens Co., OK, due to strong rotation near Loco. Moving SSE. The weather should be letting up at Gaylord Family Stadium shortly. The NCAA has a rule that the lightning must be at least six miles away. 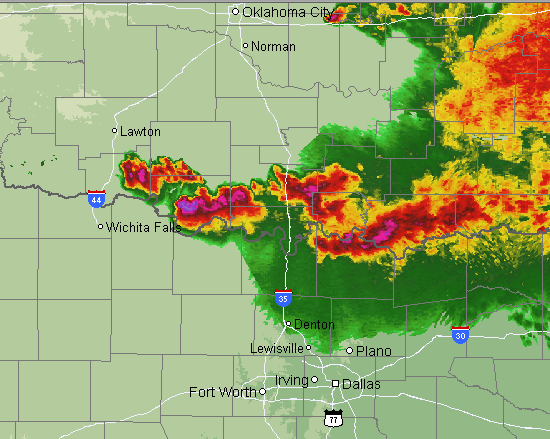 So, my game resumption time of 8:40-8:45pm CDT is still looking good. They should be fine unless the game goes into extra innings. Heavy rain, strong winds and cloud-to-ground lightning are occurring in the area with a severe thunderstorm warning in effect. I expect that they would be able to kick off around 8:40pm Central. Baseball-sized hail reported with the purple area northwest of Norman (between the Canadian River and the I-44 symbol). It is moving southeast and will come close to Norman. Game continues in weather delay. ABC Sports is reporting the delay will be "about a half hour." Unfortunately, they are incorrect. There is a second large storm northwest of the stadium moving southeast. I doubt the game will start before 8:30. A severe thunderstorm with very large hail is moving east southeast toward the Gaylord Family Stadium where the Sooners are scheduled to kick off against Texas Tech at 7:05pm. It is highly likely there will be a delay! Stadium location marked with a square. 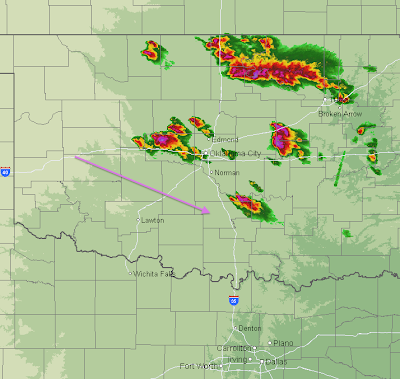 Very strong thunderstorms have developed across Oklahoma as of 6:10pm and they are moving east southeast. These particular storms are not moving toward Arlington (halfway between Ft. Worth and Dallas). However, the atmosphere over north central Texas continues to be conducive for thunderstorm development. So, thunderstorms could develop and affect the game after about the 5th inning. 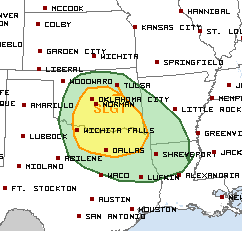 The National Weather Service's Storm Prediction Center says there is a slight risk of severe (large hail and/or damaging winds) thunderstorms in Arlington, Texas (just west of Dallas) during tonight's Game 3 of the World Series. ...Overall, Donna Laframboise is to be congratulated for writing an important book. So, how will this book be received by the climate establishment? First, I suspect that they will attempt to smear Laframboise as a denier. This is not the case. Her prime motivation seems to be a concern about free speech; she has a long standing involvement in free speech issues in Canada. Second, people will pick apart some of the minor points that are arguably suboptimal interpretations. My personal reaction as a scientist is to be very thankful that I am not involved in the IPCC. I already feel duped by the IPCC (I’ve written about this previously), I am glad that I was not personally used by the IPCC. 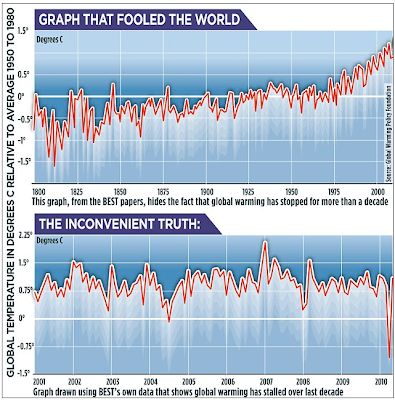 Does the problems with the IPCC mean that WG1 science is incorrect? Not necessarily, but I agree that a “new trial” is needed. I regret that so much of our intellectual horsepower and research funding has gone into supporting the IPCC assessments. Donna’s book could provide some impetus for changing this. I still have not read the book and probably won't for at least another week due to heavy travel. It is getting great reviews from people I respect. I can say this: I agree 100% that the IPCC has done more harm than good and should be disbanded. More The Other Coast here. New York, New York What a Wonderful Town! Mike was in New York this week speaking at the BOMA conference at the Grand Hyatt on Hurricane Irene and other possible weather realated disasters that could potentially affect the city. Mike brings leading-edge weather science and a knowledge of business together to make him the "go-to" expert when disaster strikes. Mike was invited to address the NYC chapter of the Building Owners and Managers Assn. His goal was to assist business owners in turning potential catastrophes into a mere inconveniences through saving lives, property and assets. The weather-related effects on the U.S. economy reached a half trillion dollars in 2010 and 2011 is running even higher. Mike gives business owners the information they need so that they will not be caught unprepared when extreme weather threatens. Mike also signed his book Warnings: The True Story of How Science Tamed the Weather (Greenleaf 2010). "It Has Likely Been There Forever"
Which Month Features Cliff Clavin? The "Nina," "Pinta," and the "Global Warming"
How Did the Plains Rain Storm Turn Out? How Is the Rain Storm Coming? New Meaning to "World Wide Web"
A Potential Method For Forecasting Earthquakes?? Happy Broderick Crawford Day, Six Hours Early!